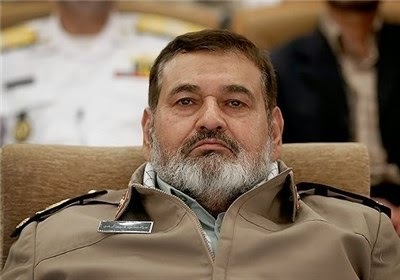 Chief of Staff of Iranian Armed Forces General Hassan Firouzabadi today send a congratulatory message to the country’s supreme leader on the nuclear agreement reached in Lausanne, Tasnim News Agency reported. Firouzabadi thanked the supreme leader for his guidelines to the negotiating team and also thanked Rouhani and Zarif for asserting "the inalienable rights of the Islamic Republic to peaceful nuclear energy." Nothing in equals nothing out. Meaningless dribble floating around the perimeter in vacuum of space.I am not holding my breath for one iota. Khamenei opposed any and all kinds of deals...suddenly he is the one to be held up high and congratulated??? Makes no real sense. This generals praise of Khamenei is nothing but lip service and a face saving remark. LOL. btw we know the real reason for his sad face. The Iranian negotiating team would not have signed off on the framework agreement, outlining in so many details what the comprehensive deal will look like, if they did not have the explicit approval of the supreme leader. I have no idea how you could say that Khamenei opposed this deal. Really? Are you saying that Zarif agreed to a deal with the U.S. on the future of Iranian nuclear program even though Khamenei opposed it? Khamenei has seen a number of nuclear negotiations that from their point of view, were not performed with sincerity by their Western counterparts. They point to 2003 and and 2010, as examples. This latest round, it's possible SL and IRGC initially expected similar results, but have recognized a change. It has to be pointed out the Iranians have not been phased by developments in Iraq or Yemen, with regards to their nuclear negotiations. Importantly, at the moment of the time deadline for nuclear talks at the end of March, the Iranians stood their ground. It was President Obama that chose to extend the talks. The notion that Iran only came to the talks out of weakness from sanctions should now be recognized by everyone, such is not so. Khamenei is the only one who has the authority and power to make such a deal. if he actually opposed it it would not have been announced,,,,,,, or it wont be formally signed. Major General Mohammad Ali Jafari just praised the nuclear deal too. This confirms it, Ali Khamenei likes the deal and will probably be the next official to issue a statement regarding the Lausanne agreement. This also makes it very unlikely that the removal of sanctions will be phased or that some major sanctions will stay in place, otherwise the IRGC would never have accepted it, let alone praise it! Reminds me of movie Zorro.